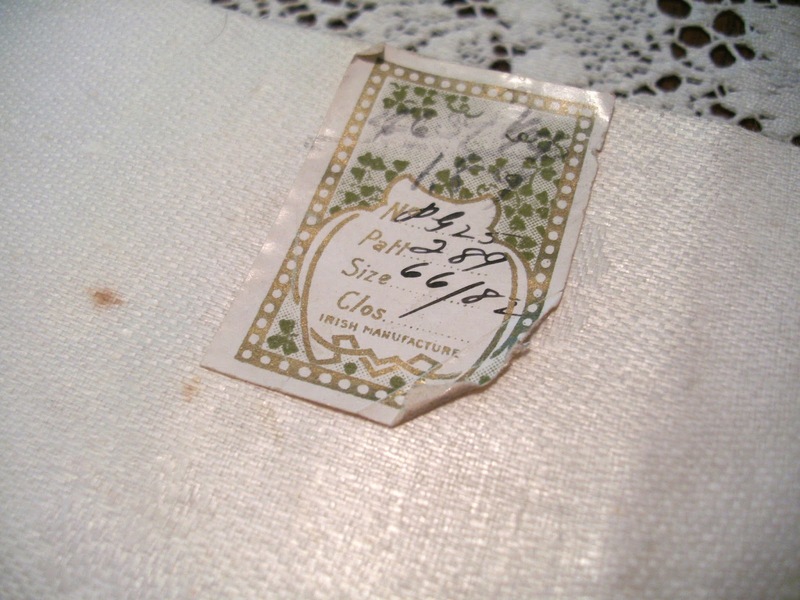 Living in central Pennsylvania, I love nothing better than discovering vintage linens, textiles and housewares at local auctions, estate sales and flea markets. Show me a row of dusty box lots, and I’ll be entertained for hours digging for forgotten treasure. Since I can’t keep it all for myself (Gramma’s closet isn’t near big enough), the next best thing is sharing it with you! Discover your next treasure in my shops to the left, or contact me for custom sewing and vintage items. Margaret P. Jennings All rights reserved. Powered by Blogger. Sometimes things just don't go as you expected. Such was our adventure out to the flea market today. 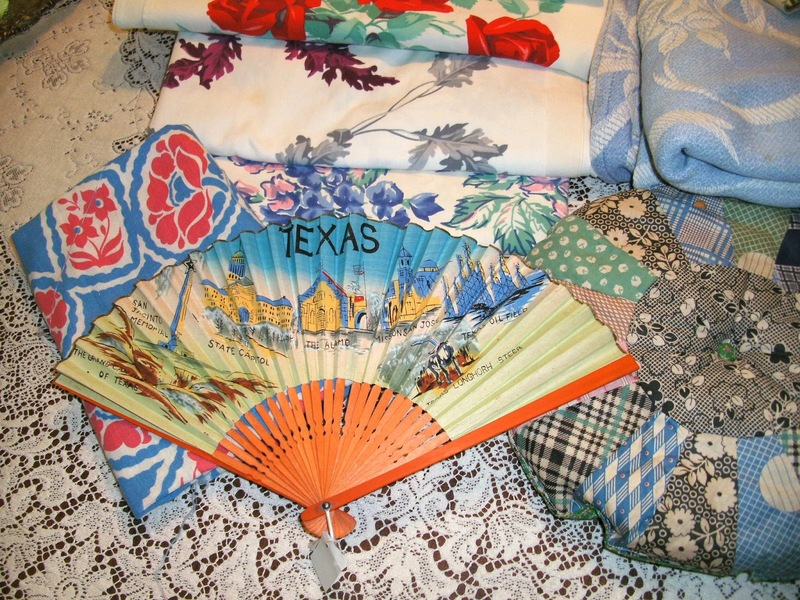 It's sort of a rule: I usually find more vintage treasure at the flea markets than I do at the antique mall. Of course, the antique mall has lots of wonderful things, but they are usually at "La dee Dah" prices, and not "Dirty Box Lot" prices. 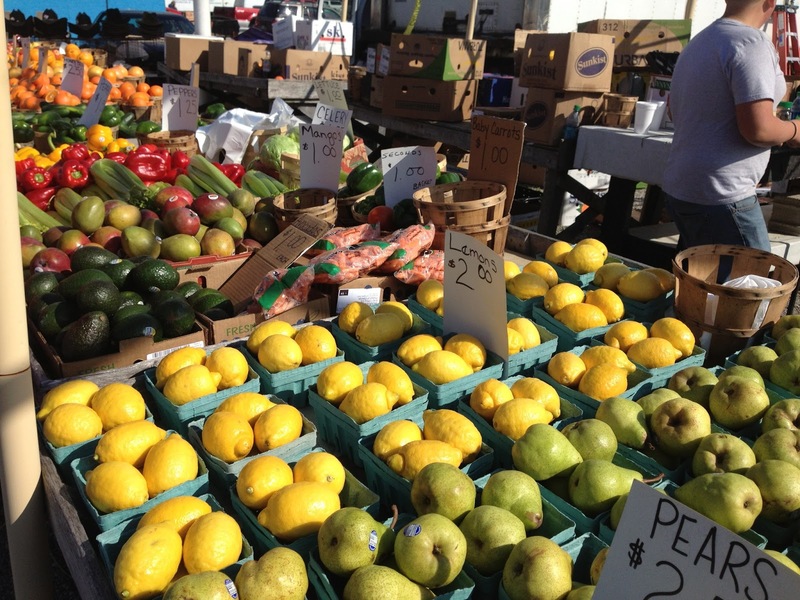 So Dear David and I set out at the crack of dawn this morning for Saturday's Market in Central Pennsylvania. 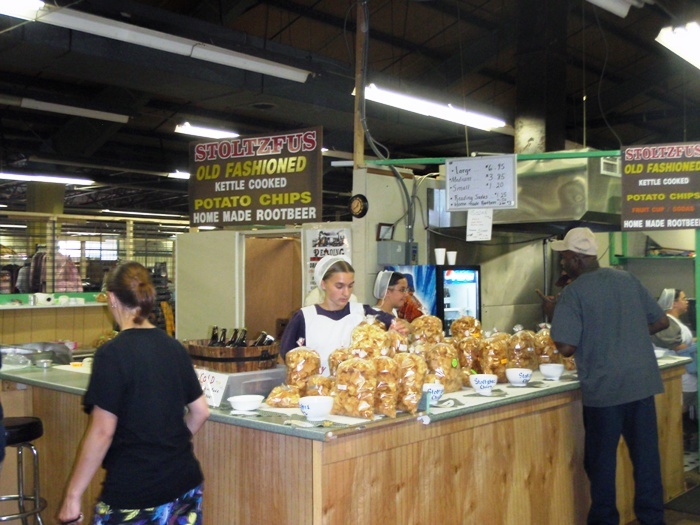 Located at a defunct discount department store building, the inside includes regular vendors with booths, along with fresh produce, Amish baked goods (OMG, the smells are wonderful) and the occasional stand selling replacement gutters or carpet remnants. Outside in the parking lot is space for the day vendors with their tables full of sunglasses, socks (who on earth BUYS all these socks and sunglasses? 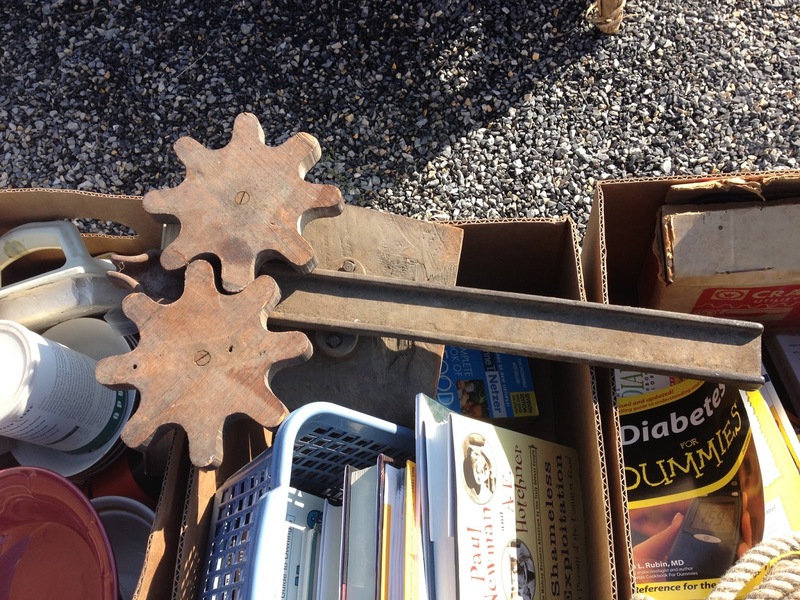 ), garage sale leftovers, flowers, used children's toys, obsolete computers and electronics, and rusty tools. And here is where things don't go as expected. 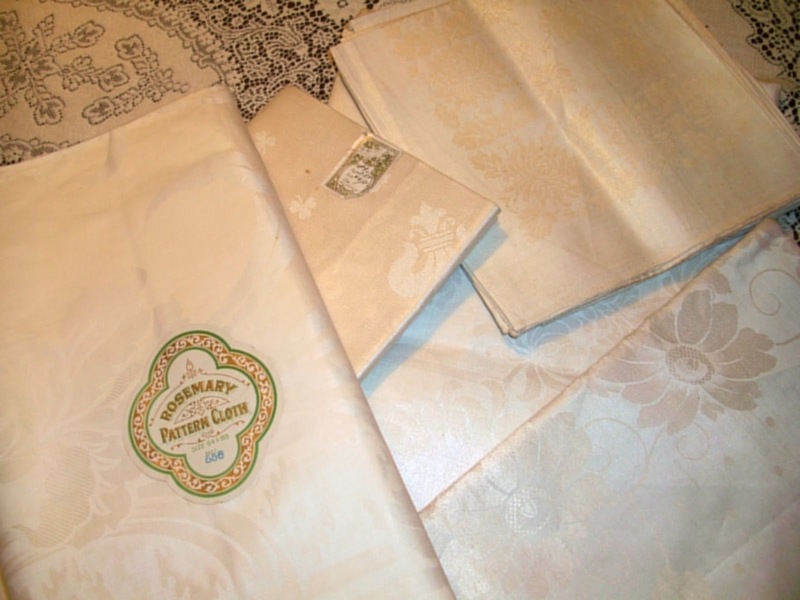 I did find a small box of gorgeous Irish linen damask tablecloths. Two of them with their 1940s paper labels, unused. On the ground. Next to the aforementioned rusty tools. At a very agreeable price. But we really didn't find much else, particularly given that both our sock drawers are already pretty full. So, we headed over to a large antique mall we hadn't visited in a while. 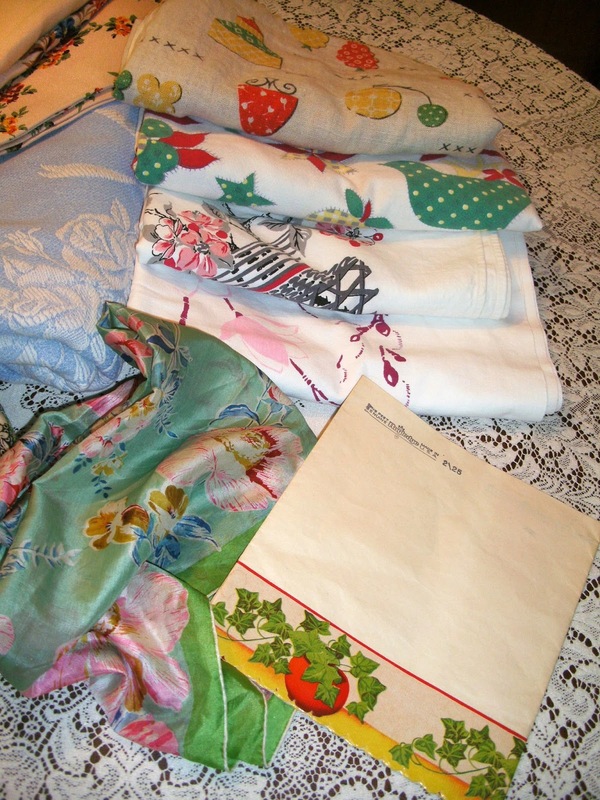 And hit the vintage linens jackpot. 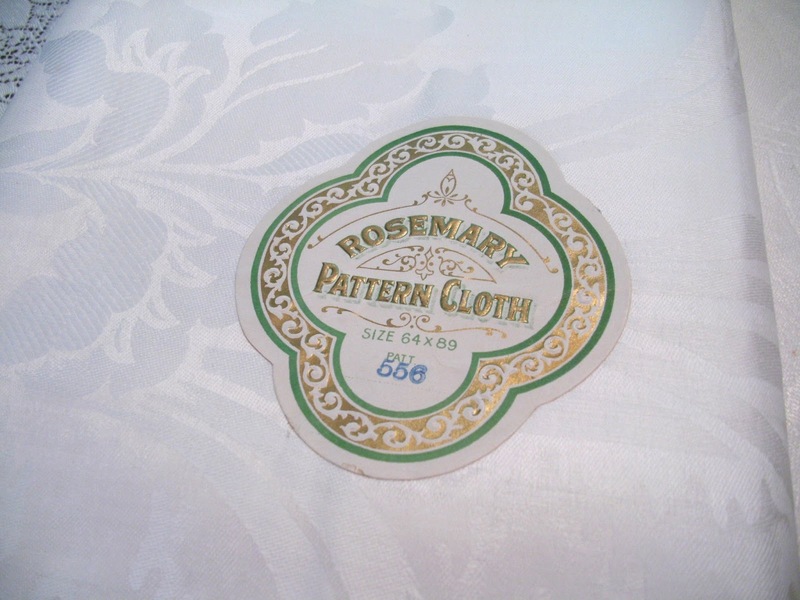 We found some great tablecloths, a Bates double sized bedspread, and some other goodies! Sometimes you just have to leave yourself open to the possibilities! A beautiful sunny Mother's Day here in Central Pennsylvania. Some mothers might want breakfast in bed. 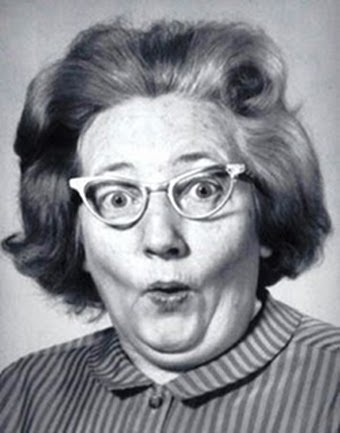 I had breakfast at the diner with Dear David and made it to the flea market by 8:00 am. 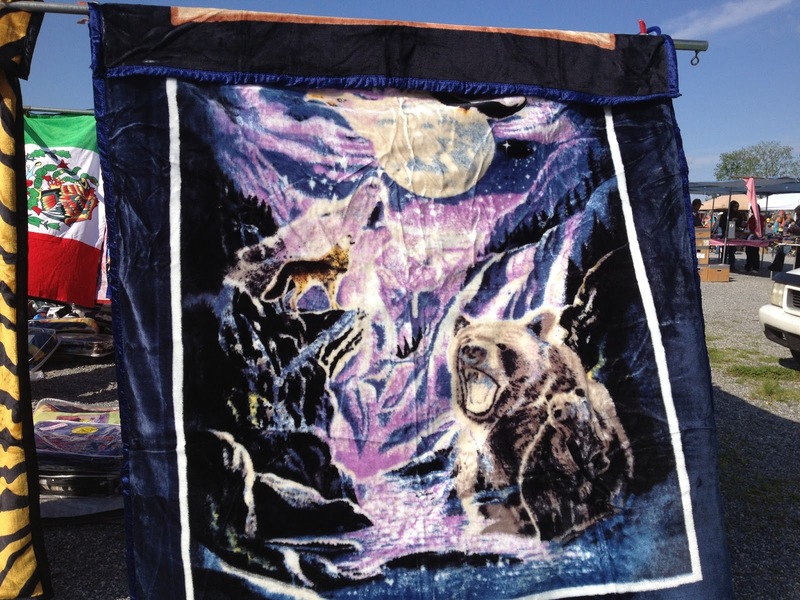 Best things about the flea market? The sheer variety! You've got your spring produce (we picked up some sweet corn for dinner). You've got your incredibly tacky velour blankets. And there was this--whatever it is. The seller said it was a dollar, or two dollars if you could tell him what it was. And there is always the unexpected. You could have this fellow for just $80! My favorite is ALWAYS the dirty box lots. I love to root around for the unusual. 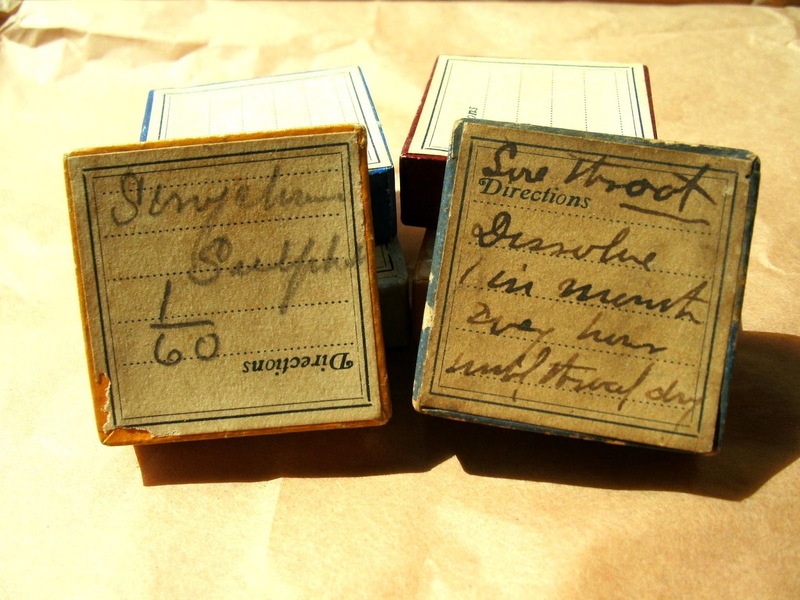 Like these little boxes that were from an old pharmacy. One of them is labeled: "Sore throat. Dissolve in mouth every hour until third day." 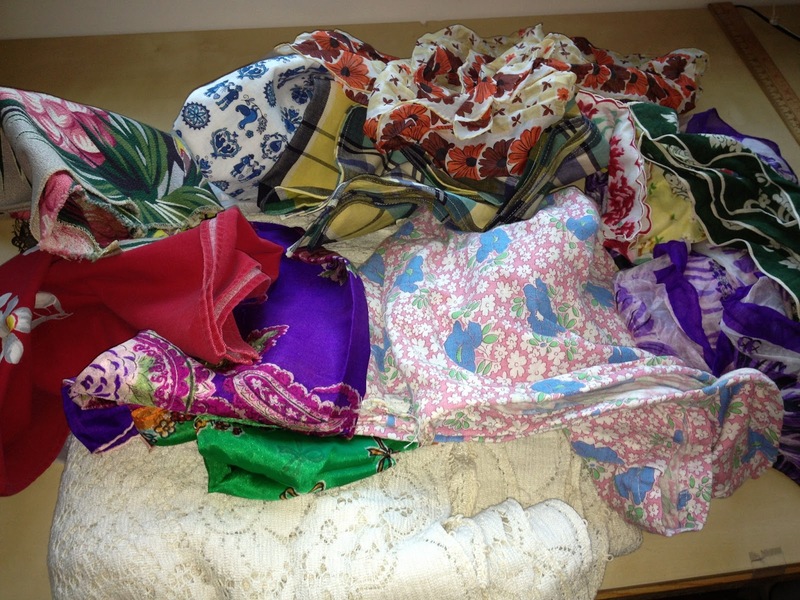 So here was my haul: A Quaker Lace tablecloth, a couple of table runners (which MIGHT be Russell Wright and Wilendur), some barkcloth, some feedsack, and a bunch of silk scarves and hankies. Because the next thing on the agenda today is pulling everything out of the garage to see what might be causing that awful smell... But that's OK. 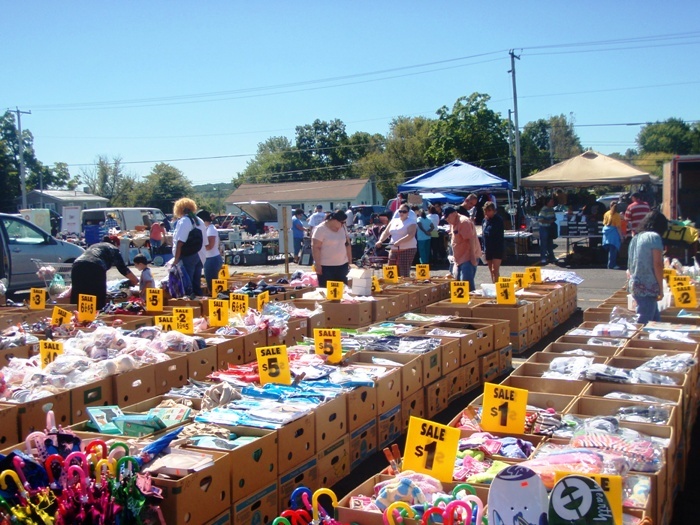 I had my Mother's Day fun at the flea market! If my eyes are open and it's not 40 below, I'd rather be out hunting for vintage treasure. 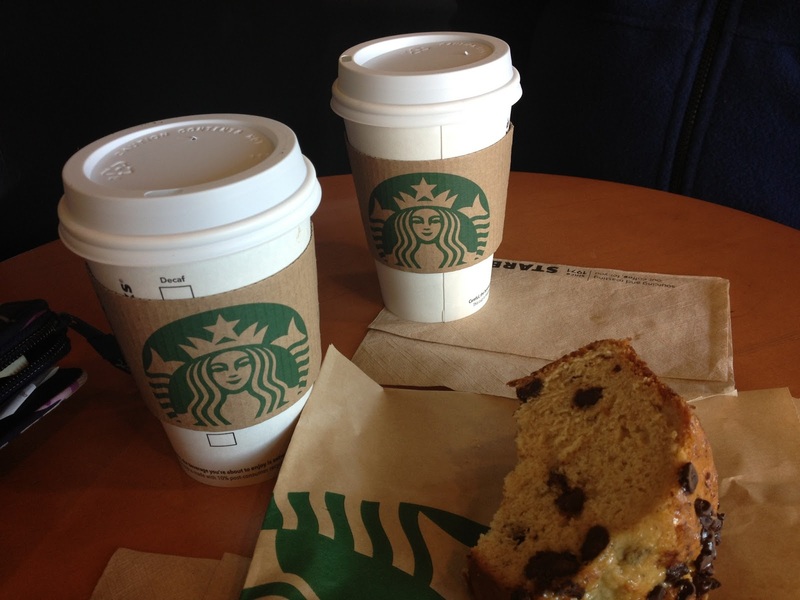 But sometimes you have to stay home and take care of mundane things. Like basic home maintenance and such. So we started the weekend in the basement. Our house was built in 1961. It's a classic split level my children always referred to as "the Brady Bunch House." And with anything that's over 50 years old (ahem--present company included), it needs some ongoing maintenance. We put in several hours in the morning freshening up the walls with Dri-Lock paint, which is not so much actual paint as it is a paint-like pudding. 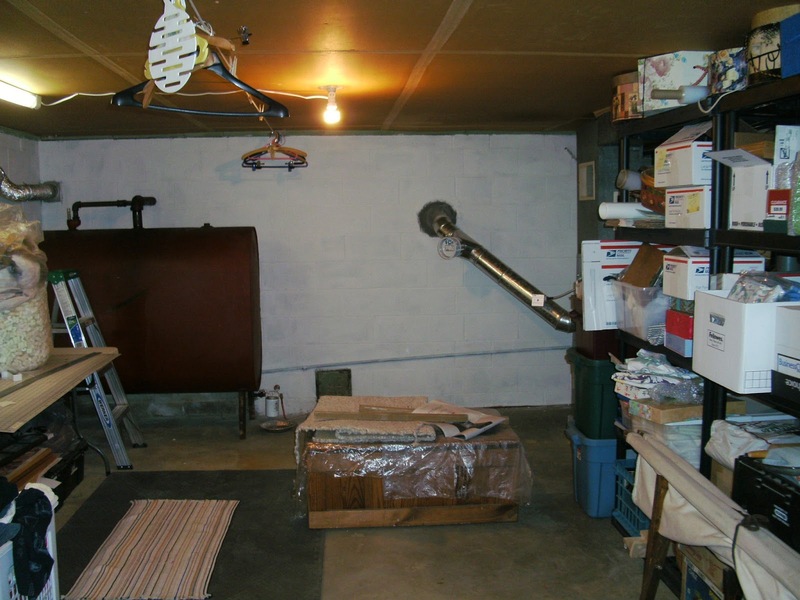 But it's supposed to keep the concrete basement from leaking, so that's a good thing. Note that Gramma's "closet" is more like a WALL of shelves! Meanwhile, we also had a truck load of mulch delivered for the yard. The sun was shining, the air was warm, and the house smelled of Dri-Lock paint and mulch. Mmmm! But we couldn't leave the WHOLE weekend to chores, could we? 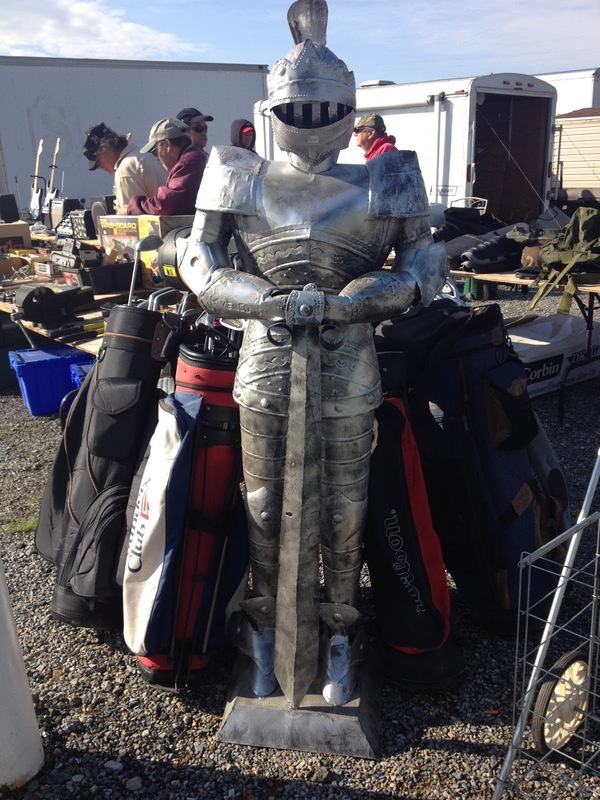 So, we finished up with a trip out to the local flea market. It's one of the first warm, sunny weekends of the spring, and the place was wall-to-wall people! We compromised. 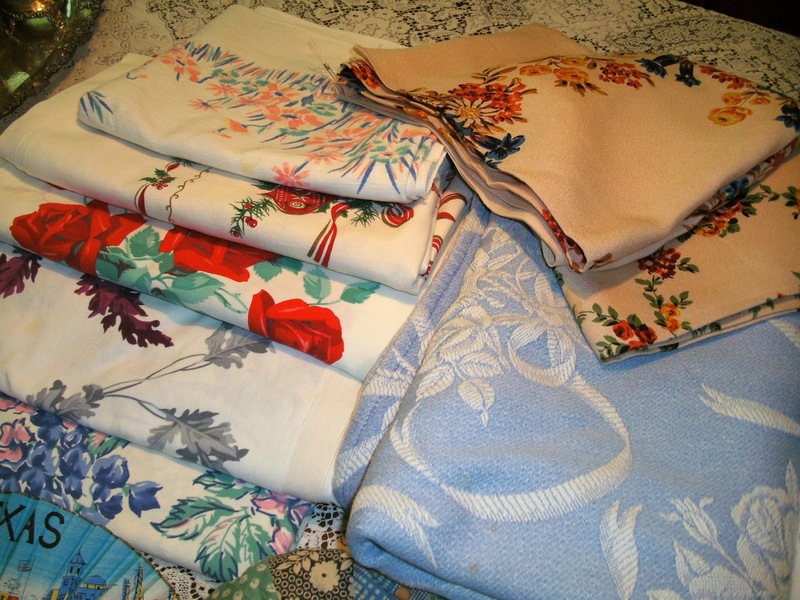 Several flats of flowers for the yard, and a small stack of linens for "Gramma's" closet.